If you're putting together a cat-themed calendar, you should consider Tortoiseshell cats for the month of November. Torties are coated in the lovely colors of Fall, which makes them perfect for that month. Tortoiseshell cats, like calicos, are almost always female and the rare male "Torties" are almost always sterile. The reasons for these anomalies stem from a complicated genetic patterning of chromosomes and genes. Torties also share a common personality trait, so unique to tri-colored cats that it's called "tortitude." Pat, a tortie fan describes it beautifully, as an over-the-top personality: impish, playful, loving, humorous, naughty at times, too clever, and totally delightful. Coco Bear is eight-years-old and, like many Torties, has an impish, playful, loving, humorous, naughty at times, too clever and totally delightful personality. She made up her mind that her owner would bring her home from the Humane Society, and her owner was powerless to refuse. She has the plushiest, thickest teddy bear coat imaginable, thus the name Coco Bear. Patches is a part Manx, Tortoiseshell kitten with a lot of personality. Her owners adopted her from a no-kill animal shelter, where she had been previously rescued from a regular shelter a day away from being euthanized. She is a real go-go kitty and her favorite game is playing fetch with a small ball. She carries the ball around in her mouth when she's not chasing it. Muffy is a talkative Tortie, always sharing stories with her owners. When it comes to doing activities around the house, Muffy can't keep away! She's always around to give a helping hand. Every person in Muffy's household knows that Muffy rules. There is never a dull moment with her around as everything she does makes her owners laugh. When this owner and his wife moved into their first mountain home, it was apparent there was a large feral cat population. They began to TNR. By the second year, there were few fertile ones remaining, but they knew there was still one black queen that was pregnant. One day, six wild kittens appeared in their yard with no sign of the mother. A week later, there were only three kittens left and one of those disappeared before they could move them into the garage. The two remaining kittens, a tuxedo cat and a Tortie, were very wild. It took a long time to tame them down, but Starbust, the Tortie, is now a confirmed lap cat and the tuxedo cat, Tuck, is the sweetest cat on earth. Niki came to live with her owners when she was eight weeks old. She is affectionately called Snickerdoodle and is very choosy about to whom she shows affection. Bailey was abandoned by her previous owner when she moved out, leaving her and another cat behind. A woman took both of them in and was trying to rehome Bailey. Because she had a full hand, her current owner offered to foster Bailey while trying to rehome her. These efforts were abandoned when she curled up in her new owner's lap one day. She arrived a pretty prickly, untrusting cat, but her new owner had patience with her. Turns out that some of her teeth were severely decaying, which contributed to her growly prickliness; so once she had those teeth removed; she became a loving, affectionate cat. Doesn't the name "Havoc" just remind you of a cat with a 'tude? This is Havoc. She's full of "Tortitude," especially with her cat siblings but she's all sweetness and drool with her owners. Havoc is one of the few cats who actually earns her keep, as she is a fantastic mouser. So much so, that she's earned the nickname "Mighty Huntress." When she hears that, she walks around with her fantastic brush tail stuck straight up into the air, tip waving ever so slightly. This is Pif. His favorite activity is playing with a paper ball, which is exactly what he was doing when this photo was taken. Being a Tortoiseshell, people tended to consider him ugly when he was little. With this picture, he shows the world just how wrong they were! Sadie is a tortoiseshell kitty with a little squeaky voice. She is two-years-old, and the sweetest kitty that her owner has ever known. She had Total Ear Canal Ablation surgery last year, which is the removal of the entire ear canal. It took about three months for her to recover, but now she is more lovable than ever. She likes to drag around her string and cry for her owner to come pet her. She also loves to sit next to her owner and has become quite a lap cat. OOT showed up in the middle of a June night and invited her starving self into her current owner's home. Once a scrawny, three-pound scrap of a cat, she has grown into a beautiful companion full of hiss, spit and OOT-titude. This is a three-year-old Tortie named Isabelle, her owner also has an Orange Tabby named Little Harry. They are getting adjusted to living together, which can be a rocky road when it comes to cats, but they both love their owner immensely! Isabelle was a feral baby adopted around five weeks old and Harry was a rescue. Ivy was found within three minutes of her birth, abandoned by her mother. Her owner found her in a patch of Ivy, which is how she got her name. Two years since finding her, Ivy has become almost like another child to her owner. Misty Lee is this Tortoiseshell's name and she was just five weeks old when she first fit in the palm of her owner's hand. She is a calico/Blue Persian and has grown since that first encounter - she now weighs 22 pounds! Misty Lee is a smart cat, and will earn treats by giving her paw to her owner. 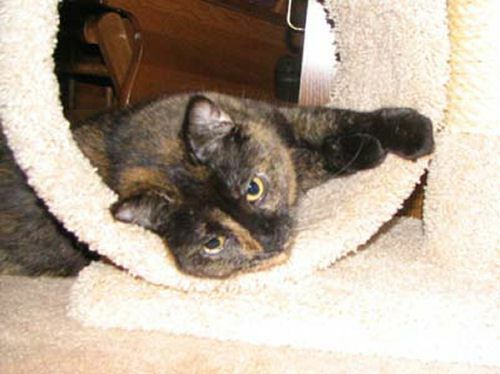 This Tortie's name is Mudpie because she looks like she rolled around in a slice of mud pie! She is a September baby and loves the autumn - maybe it's because of her autumn coloring. This is Allie. she's two-years-old and is the second oldest of four cats. Her owner found her as a kitten while skydiving one summer. Allie no longer skydives, but she still has an unpredictable edge to her personality. She's totally fearless and the leader of her cat clan at home. Baby was rescued from a New Jersey shelter 15 years ago with many ailments and a grim prognosis from the vet. But her owner was determined to nurse her back to health. Today, she continues to be a healthy and active senior feline. Loving, talkative, and funny, her favorite things are peacock feathers, baskets to sit in and watching her favorite shows. Baby and her owner love to snuggle together under the covers while watching Animal Planet on TV. This is Chloe Nicole Kane. Chloe is a naturally inquisitive indoor cat who has gotten herself into many mischievous deeds for entertainment purposes. She hardly ever meows and has been shut in closets, and the attic, She's so laid-back that she'll just sit down and take a nap until you return to free her. Sonsy just celebrated her fifth birthday. For her birthday occasion, her owner gave her a rare people-food treat: squirt cheese on her birthday candle. She spent the rest of the day celebrating, eating cat treats, and having a lazy cat day. Patch is a four-year-old cat that was rescued when she was a nursing mom from the streets. Her owners were able to find homes for all of her kittens and get her fixed. Now she is an indoor cat and lives like the queen that she knows she is. Piper is a beautiful girl, her full name is Prudence Raven "Piper" Maru Phoebe Dandelion Paige, but her owners call her Piper, sometimes Pipey or Pipe for short. She is a Long-hair Tortoiseshell Burmese and she is exactly what "Tortitude" describes. She loves to lay around the house (especially on clothes that have just recently been taken out of the dryer), drink water straight from the faucet (and sometimes the toilet! ), chase bugs of all kinds and be very picky about almost everything. Getting in trouble is her favorite past-time. This Tortie's name is Normal. She is 16 months old and the light of her owner's life. In this photo, she was dressed up as a princess for Halloween. This cat's name is Kiwi. She loves to take a sunbath in this window, and her owners know they can always find her there when the sun is shining. They found her as a kitten at the front door of a local restaurant and decided to take her home. Natasha is a Tortie with an overabundance of "Tortitude." She likes to torture her pet siblings, a dog and a chubby orange tabby. This is Hayley, a beautiful yet shy long-haired tortie. She loves to be petted but freaks out if you try to pick her up. She also enjoys watching TV with her pal Boots. Recently, she has become fascinated by a math class on public television! This is Autumn. She and her owner met two years ago at a waterfall, where her owner went to see the autumn leaves. There she was, walking around on the rocks, meowing at everyone. She had obviously been abandoned, as there were no homes in the area. Her owner scooped her up and brought her home, and she immediately became the alpha-female in a "family" of 14 cats. This Tortie's name is Eartha Kitty, and she is full of personality. In this photo, she is sitting on her current "Blanket of the Month." She prefers chenille to scratchy wool any day of the week. Macy is a one-month-old Tortie. As you can see in this photo, she is quite the inquisitive little kitty, following her owners around the house and blazing new trails for her brother and two sisters. She is sure to be an entertaining and loving member of the family for a long time. Turtle is this Tortie's name and she is about four-years-old. Turtle hides most of the time, just like a turtle would hide in his shell. She loves to chase laser lights and a plastic top hat that she carries around the house. In this picture, she was sitting on the speaker. Music was playing, and she was looking at the speaker above and behind her to see where the music was coming from. This is a 19-year-old Tortie, Muffy. Her owner has had her since she was six weeks old. Muffy is as kitten soft as the day her owner brought her home and is in good health, except she is now deaf. The secret to her youthful looks is unknown, perhaps it's from her cat food! Her favorite treat is chicken, so she is not hard to indulge. This is Harley Davidson, so named because she has the loudest purr you've ever heard. She is a classic long-haired Tortie with a "tude." She was adopted from a local Humane Society when she was three-months-old, and she's grown to be 11-years-old. Normally, she's gentle as a lamb, except at her vet. It takes three aides to hold her down to trim her nails. Although she was a reluctant "auntie" to her owner's new kitten Lucy, she became a very affectionate auntie after all. She's a silly girl. This picture really captures that crazy attitude of hers. This is Milagros, a beloved Tortie. She is a little over nine-years-old, and one really clever cat! She knows how to open the doors and she uses a toilet seat for her own private business. It's a mystery to her owners, as they didn't teach her to use the toilet seat. She is a lot calmer as an older cat than when she was a kitten. She enjoys long naps and snacking on her favorite food. Mallorie was adopted from a rescue center. She loves to play ball on the stairs and is a little lover, always seeking out her owner to nap on her lap. This is Fluffy and she is almost seven-months-old. She is very high-spirited and loves to play sneak attack on her owner. When she was six-weeks-old, she looked like a striped cat, but when she went to the vet for the first time, her owner found out that she was actually a Tortoiseshell. Kit is four-months-old and was rescued from Galway, Ireland. Kit loves playing with flowers, butterflies, and bumblebees. She is named after "Kit" whom she looks like, from the Joe Grey Mysteries by Shirley Rousseau Murphy. Like her namesake, she is surrounded by mystery. This owner's dog Roo found Rocky underneath a bush in their backyard and brought her up to the house. Rocky was barely able to walk and her eyes were just opening at the time. Now, five years later, she's an affectionate, happy twenty-pound Tortie with an attitude. She was named Rocky on account that when she was little she'd box Roo with her front feet like Rocky Balboa-she boxes on her owners sometimes just to keep them in line! This is Scud Muffin, she was born, her mother was rescued from starvation and death by her owner. One month later, she gave birth to four adorable kittens. Unfortunately, her brothers and sister did not have luck on their side. They sadly didn't live long after birth. Scud Muffin is now living her life with another rescued cat named Jonny. They love to play and wrestle with each other. Scud starts out the morning running laps back and forth through the hallway and in and out of rooms. Next, she eats her fill of cat food and takes a long nap on her owner's bed. At noon, she sits on the window sill and gazes out the window thoughtlessly. In the afternoon she sleeps next to her owner while finishing up homework. Scud is her owner's true inspiration and love. This is Luna. She was rescued after Hurricane Katrina from a shelter in New Orleans. She tends to be a bit moody around other people except for her owner. She loves to play with toy mice and Smarty candy wrappers. Her owner loves her and hopes to have her for a very long time. This is Tortie Mama Cheetah or M.C. She tried to live with her owners for over two years. They resisted because they had a cat. One summer, the temperatures soared and they thought she lost a litter of kittens. She was so stressed, that they started feeding her and leaving plenty of water out for her. One day, she brought along two surviving "lost kittens." They fell in love with them all. Everyone went to the vet for shots and worming and spaying or neutering as appropriate. Only one kitten survived, the boy, Harry the Bear is now a 16-pound lovey kitty. Having fended for herself for so long M.C. is not satisfied to be indoors all the time. She is however very selective when she goes out. If it is too hot, cold, windy or wet she is most content to stay inside and nap in the middle of the guest bedroom-which she has claimed as her own room. Melinda, a Tortie Tabby was adopted from a pet store which specializes in assisting the local SPCA with their pet adoptions. She was the first adoption from the newest store location near her owner's home and the fame has "gone to her head." Everyone needs to cuddle her or rock her like an infant. When someone visits, Melinda will greet them if the local bug population doesn't have her attention. She seems so grateful for her new home that she brings her owners nearly daily "gifts" of any bug or rodent that may have crossed her path. Melinda has also taken over certain parts of the home, much to her new sister's disgust. It took some time but they have each established their own zones. This owner's Tortie and white, Keeko, was adopted at the local animal hospital after she was given up for adoption. Her former owners thought she was a handful but some TLC changed that. Now she is a valued member of the family and somewhat of a celebrity. People come to the house just to visit her. At nearly six, Keeks is ready to relax and cuddle her days away. However, she still has lots of vocal talent which she uses to make her presence known. A visit to this owner's home requires one to acknowledge the girls. Keeko howls and opens at the treat cupboard while Melinda patiently waits close by for her share. After their snack, it is time for the pats, cuddles, and conversations. Both cats love attention and visitors so much that their owners have taken them on trips to pet stores, parks, church and other kitty approved places. Many people can't imagine one cat on a leash, so seeing two cats on leashes is indeed a rare occurrence. Melinda and Keeko draw attention where ever they go, just as they like it! This is beautiful Molly Ann.The fun thing about her is that she talks to you! She is truly one of the sweetest pets that her owner has ever had.